The Pride of North Dakota, the North Dakota State University Gold Star Marching Band will make a special appearance when they perform in Londonderry’s Guildhall on the afternoon of Tuesday March 13 as part of their 2018 Tour of Ireland. Hailed as one of the US’s oldest university bands involving students from every major, not only music, the Gold Star Marching Band been on campus since 1904. In addition to performances at sold out games for the 6 time NCAA Division 1 FCS National Champions NDSU Bison, they have taken part at the St Patrick’s Day Festival in Dublin in 2015 and are set to return to Dublin for this year’s event. The group of 100 musicians, ranging in ages from 18 to 23, will travel around Ireland prior to taking part in Dublin Bay Prawn Festival on March 16 and the St Patrick’s Day Parade in Swords/Blanchardtown, Dublin in Dublin on March 17. Delighted to be returning to Ireland and to be including Londonderry in their itinerary, Dr Sigurd Johnson, Director of Athletic Bands and an Associate Professor of Music at North Dakota State University, says the band are really looking forward to performing for the Derry audience. He said: “We are really looking forward to coming to Derry and performing our range of popular upbeat and well-known songs. He added that the Gold Star Marching Band is very proud of the fact that 80% of the band are non-music majors and the number of different academic majors represented by members in the band typically number between 60 and 70. 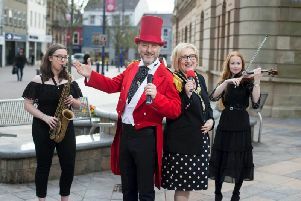 Mayor of Derry City and Strabane District Council Cllr Maoliosa McHugh says the performance of the Gold Star Marching Band is a great way of getting local audiences excited ahead of the council organised St Patrick’s Day Spring Carnival celebrations that are taking place on 17 and 18 March. “I am really looking forward to seeing the band perform in Guildhall Square and then onto the historic City Walls. It’s a great coup for the city and district and I am sure they will get a very warm welcome,” he added. The visit by the Gold Star Marching Band is one of a number of exciting events taking place in the city and district for St Patrick’s Day. Derry City and Strabane District Council has an action packed schedule of entertainment in both Derry and Strabane that includes a carnival parade, family friendly fun activities, live music, dance and food. The weekend also includes the Legenderry Food Festival in Guildhall Square and the Ubuntu Global Festival. For more info on the GSMB find them on Facebook at NDSU Gold Star Marching Band and Twitter @gsmbndsu.